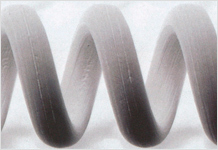 Using superior manufacturing techniques and the latest equipment, Nippon Seisen is mass producing the thinnest individual stainless steel wires in the world. 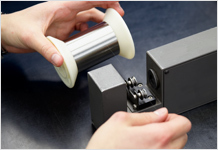 Additionally, the tooling used in this manufacturing is all produced internally, which supports our consistent product quality and supply capability. With a diameter of 11 microns, Nippon Seisen's ultra-fine mesh wire is expanding production capability to steel wire's limits. 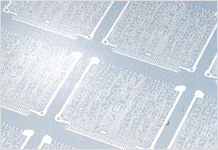 This product is being used in applications demanding high precision and high miniaturization such as screen printing and high performance filtration equipment, and is an indispensable material in the production of goods as diverse as solar cells, condensers, touch panels, and microfilters. Nippon Seisen's ultra-fine spring wire is produced using strict quality assurance conducted by expert workers, and has a good reputation with our customers due to its conformance to typical diameters and consistent workability. Additionally, in response to customer requests, we can produce ultra-fine spring wire for nonconductive, high strength, and high corrosion resistance applications.